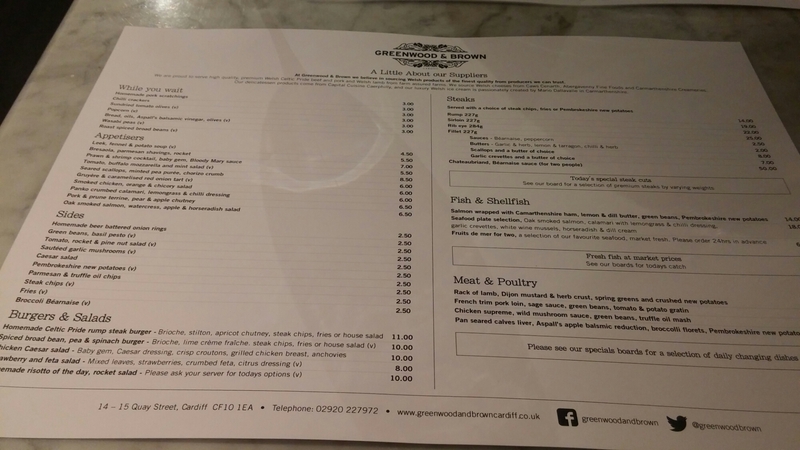 For those of you of a squeamish disposition (that includes me when it comes to eating the brains of any animal other than tiny fish, molluscs and the smaller crustaceans), the title of this post refers to the fact that Greenwood & Brown (in Cardiff City centre) is owned by Brains Brewery and not to some macabre Hannibal Lecter themed lunch. With mixed reviews on Tripadviser, Greenwood & Brown appears to be very much a marmite sort of place. Some people seem to truly love it, but for others service (or lack of it) seems to be a particular bugbear about the place. For a lads lunch, despite the mixed reviews, it was choosen on a majority vote (I abstained) from a list of suggested venues. 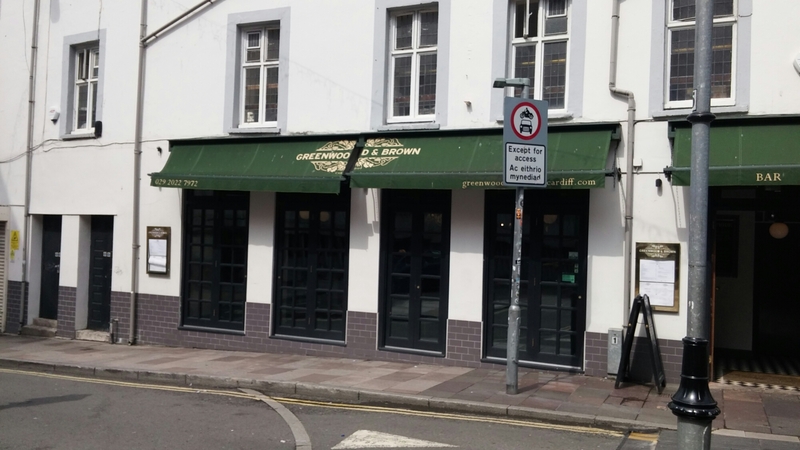 It is located in what was, many years ago, a particularly grotty pub and on the outside it is not exactly welcoming. Inside it is quite clinical. Lots of sharp edges and shiny surfaces. 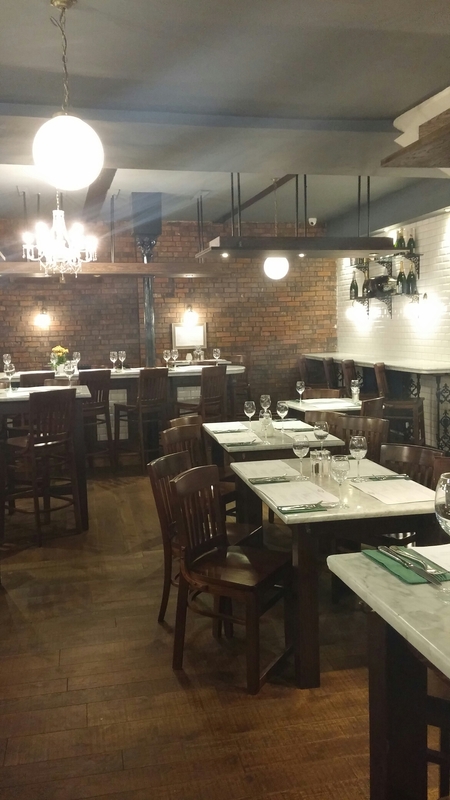 The white gloss tiling and marble top raised tables gave it an unfortunate, ever so slight, air of a Victorian era public convenience (at least to my mind). As a result, I was not at all sold by the look of the place. It perhaps didn’t help that we were the only people in there for the duration of our visit. This, with the stark decor, made it a bit soulless. 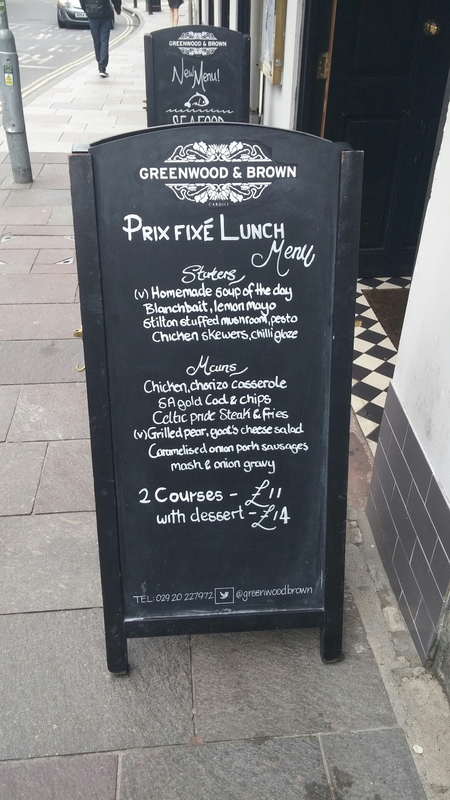 They have a fixed price menu on offer (£11 for 2 course and £14 for 3), but it looked a bit pedestrian and had the dreaded supplement (£2 – rather naughtily it wasn’t on the board outside but was on the menu inside) for a steak (feather steak this time) on it. 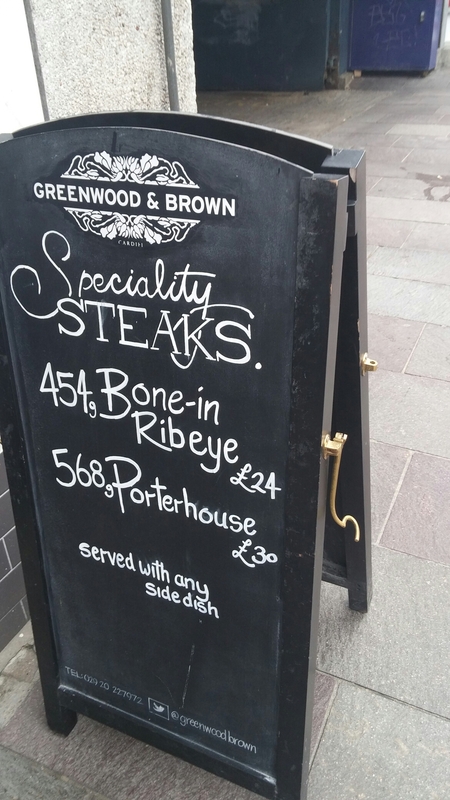 I like feather steak, which is a cut that has a good flavour to it, but it is not that pricey (being one of the, if not the, cheapest cuts of steaks you can in theory cook quickly) and I object to the £2 mark up applied to it here. As I have said before if you need to add a supplement to a dish then it shouldn’t be on a fixed price menu. I, therefore, passed and looked for something on the al a carte menu which was of more interest (if a little pricey in areas). I was tore between the French trimmed pork lion cutlet, with black pudding mash, parsnip puree and sage sauce (£12), the chicken supreme, with truffle oil mash, green beans and chestnut mushroom sauce (£13) and the calves liver (£12) but eventually decided on Welsh coast mussels, with a choice of sauce (£12.50). Odd pricing here, with calves liver much more expensive to buy retail than mussels in my experience. As I am a sucker for a good bowl of moules, I went for these with a classic cream and garlic sauce (with parsley allegedly) to which, interestingly, SA Gold Brains bitter rather than white wine had been added. When in Rome as they say and a choice consistent with the post title, with mussels eaten brains and all (albeit very small ones). This was a decent size portion and the mussels were nice if not particularly plump, but as a whole it had a few issues. The addition of the SA Gold bitter to the cream and garlic sauce didn’t work for me, as the sauce had a rather strange aftertaste. Not actively unpleasant, but not particularly pleasing to the palate either. 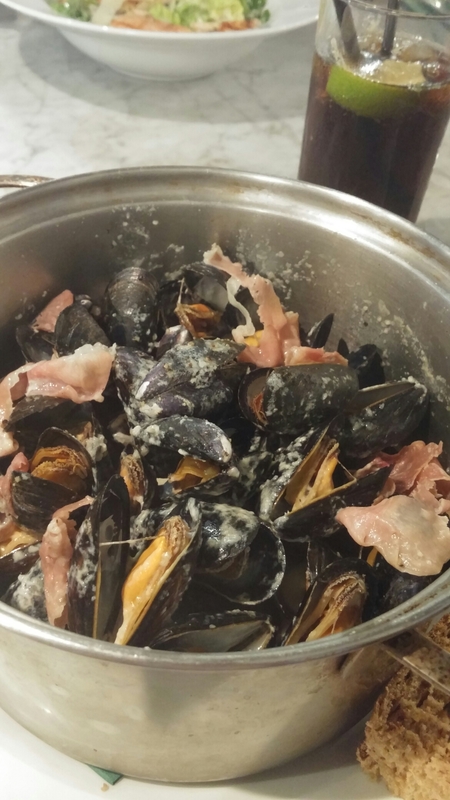 Also prosciutto had been strewn willy nilly over the mussels (as an after thought I suspect rather than by design) and was not chopped fine enough, so it just stuck to the outside of the mussels. No sign of the advertised parsley, which I assume they forgot to add, and not much garlic in evidence. 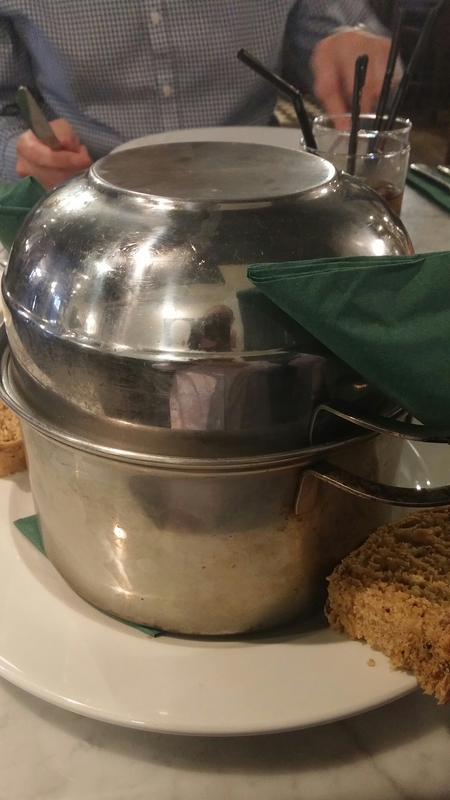 There wasn’t enough bread to mop up the copious sauce in the bottom of the pot nor was a spoon provided to get to it. As a result (usually) one of the best bit of a bowl of moules was left inaccessible. Had the sauce been better I would have been mightily aggrieved by this. All in all an interesting idea that didn’t quite work. 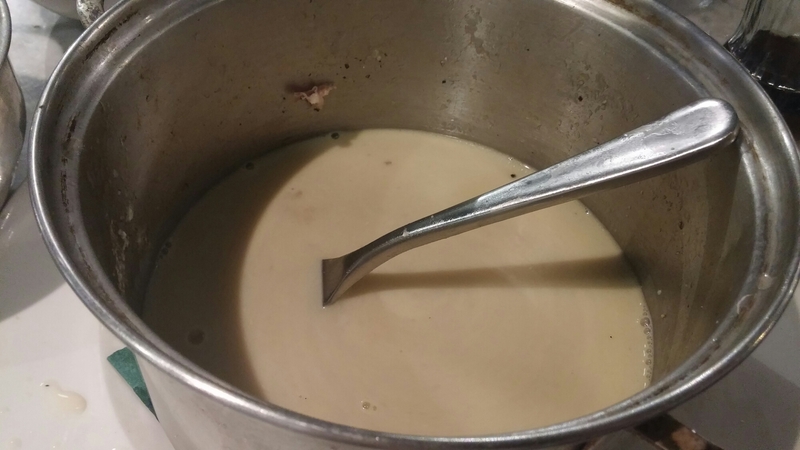 I think they should ditch the cream in the sauce and go for a less bitter (Belgium style) beer or better still stick to the classic white wine recipe (it is a classic for a reason after all). 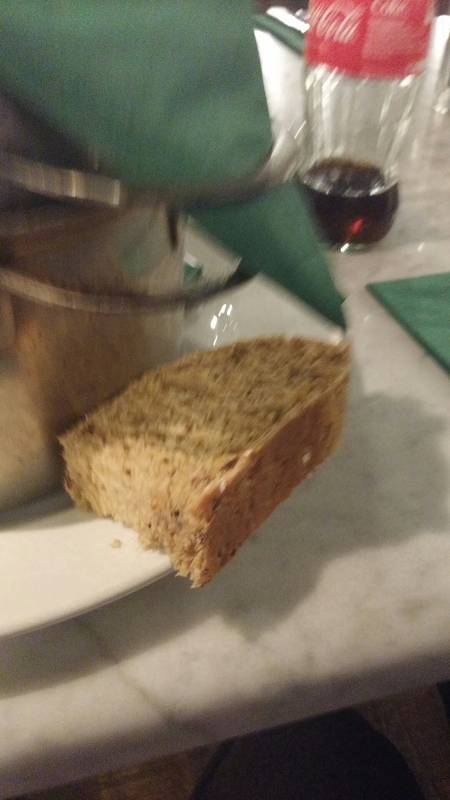 More bread and a spoon would then also be required. For the price of £12.50 (mussels being pretty cheap – £3 a pound retail tops, which is one portion) some frites wouldn’t have gone amiss either. To put this £12.50 price in context, you can get half a lobster salad Nicoise at Burger & Lobster for £12.50 Makes the moules, with one measely round of bread, look somewhat pricey doesn’t it! 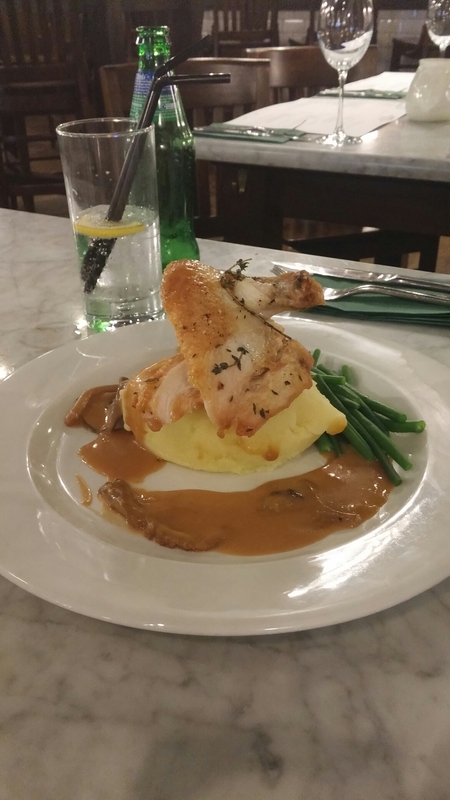 and the chicken supreme, with truffle oil mash, green beans and chestnut mushroom sauce ( £13). Both were pronounced as nice enough without exactly setting the tastebuds on fire. 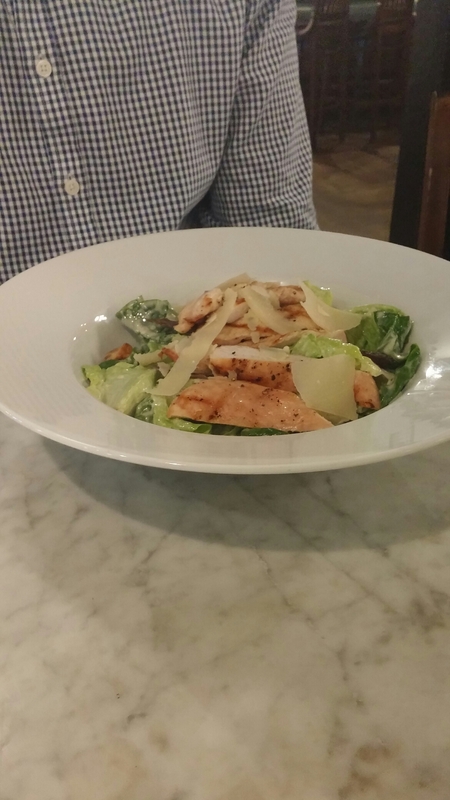 The Caesar salad had a good dressing, but the chicken was said to be a bit dry and the croutons didn’t taste home made. Also the lettuce used (gem – my preference is romaine) was chopped up far too much for my tastes. As for the chicken supreme dish, I was told that the chicken itself was nicely seasoned and tasty but the mash lack any real truffle flavour and to me the mushroom sauce looked a touch over reduced and a bit gloopy as a result. It was a work day lunch and I forgot to look at the wine list/alcohol menu before it was whipped away by the waiter, when it became clear booze was off the agenda. Annoyingly I can’t find one on their website. Not much to tell on the drinks front as a result. I had a coke – it was OK and had a slice of lime (and so often missing), with the ice in the glass, which was nice. Being the only people, for the duration of your meal, in what is quite a large space is always a bit disconcerting and the food whilst OK was merely that. 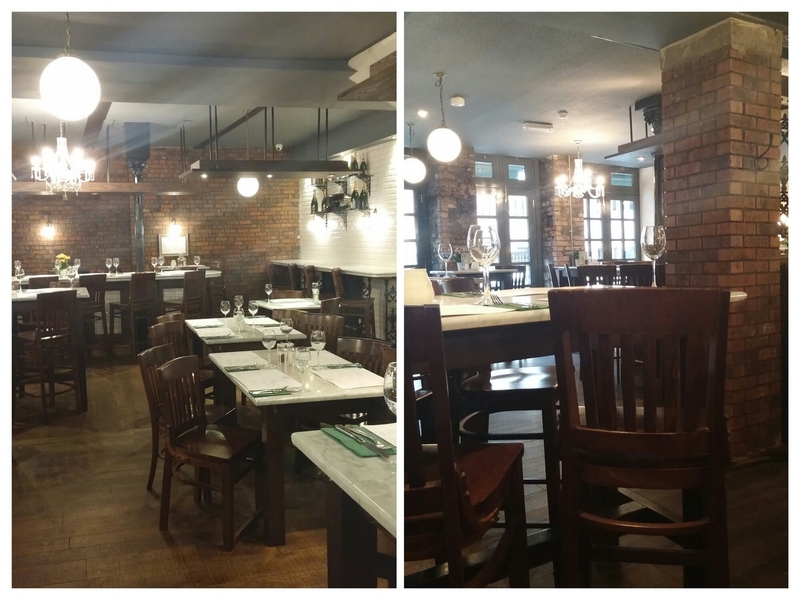 This may explain why it was empty, bar from us, between 1pm – 2pm on a Thursday during August. Service was fine, although bearing in mind we were the only customers it perhaps took longer than expected to get out one course each. Not sure how long the 2 or 3 course fixed (ish) price lunch would take on this basis or what service would be like if the place was busy. 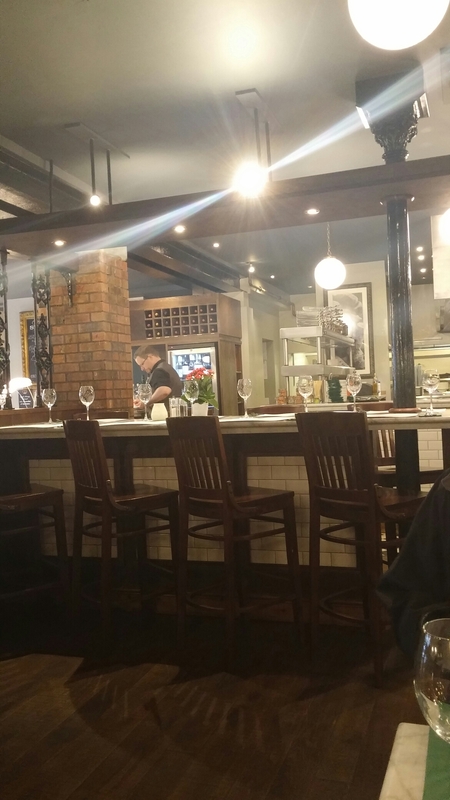 I got the impression from watching the chef – it has an open kitchen – that he was thankful for something to do, so took his time and spun it all out a bit. There is an old adage, I swear by in work, which is if you want something done quickly give it to a busy person not someone who has nothing to do. It probably applied here. The damage was just under £43 (ex. tip) which as against some of its lunch time competitors seemed not that great value to me for what we got. but I am in no rush to find out to be honest. 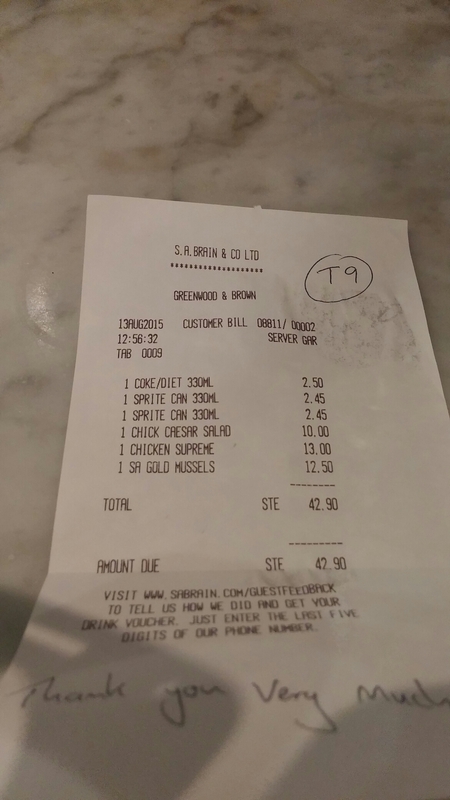 This entry was posted on Sep 6, 2015 by solicitingflavours in bitter, Brains Brewery, Cardiff, Cardiff restaurant, Drink, Fixed Price Menu, Food, Food and wine products, Greenwood and Brown, lunch, lunchtime, Moules, Mussels, Restaurant Review, review, Wales.